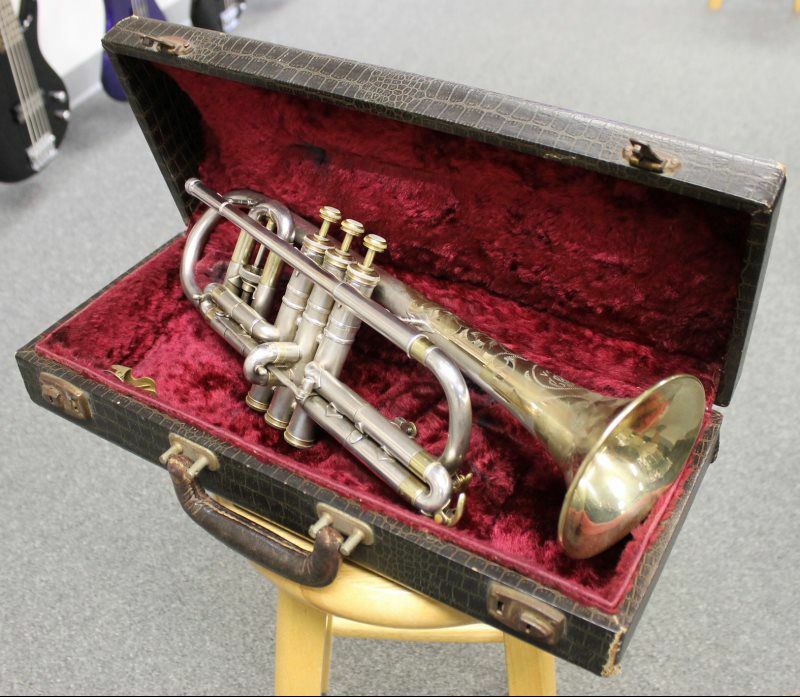 This beautiful cornet just came in from the original owners Daughter - its in immculate condition. We just had it completely cleaned and gone through at our Tech shop. We dated it from the serial # and looks like it was made in 1924. It comes with the original case and lyre, but the mouthpiece is missing! This is a well preserved cornet that is ready for the next 100 years!! Finish - Silver/Gold with Nickel appointments?? Notice the micro-tuning mechanism just forward of the first valve. Also notice the "mechanism" attached to the first and third slides. This automatically adjusts all slides when the main tuning slide is pulled out to A. The 80A started out life as the "New Wonder", then the "Victor New Wonder" and finally simply as "Victor". If you compare the "New Wonder" specifications of 1914 with the "Victor" specifications of 1957 you will notice the Victor gained 7 ounces in weight compared to 1914. I don't know when that weight was added. The 80A New Wonder has a #2½ bore (0.484"). Also, this model 80A had top spring valves with adjustable spring strength, while the later version had bottom spring valves. A minor detail is the second slide which on this model is at a right angle to the body of the instrument, but on the later version angles back towards the player. Read the booklet Conn included with these instruments, entitled What you should know about this instrument for more on the "mechansim", the micro-tuning mechanism (a.k.a. opera glass tuning slide) and the adjustable spring strength. Production started no later than 1914, and possibly earlier. The 80A with mechanism was discontinued sometime around 1939. I have learned that the third slide without the finger ring to adjust the pitch of a low D and C# is slightly longer than it is on modern instruments. On modern instruments the low Eb is in tune, but the low D and C# are quite sharp. On these older cornets with the longer third slide no finger ring the Eb is a bit flat and the D and C# are slightly sharp, but not as sharp as they are on later instruments. It was thought that the flat Eb and slightly sharp D and C# were within the abilities of the player to lip into tune. As far as I can tell at this point, all Conn cornets built before 1958 take a short shank cornet mouthpiece as opposed to the 2¾" "Bach-style" long shank cornet mouthpiece. 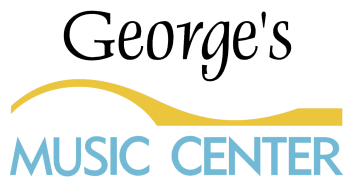 The long shank cornet mouthpieces won't properly fit a pre-1958 Conn cornet and won't give the proper intonation or playing characteristics of a short shank cornet mouthpiece. All of Conn's "Connstellation" cornet mouthpieces are long shank mouthpieces. The "Improved Precision" Conn mouthpieces such as the Conn 4 are long shank if there is a "ridge" halfway down the shank, and short shank if there is no ridge (in which case it is a "Precision" mouthpiece). All Conn cornet mouthpieces built before the "Improved Precision" series (ridge), such as the "Precision" series (no ridge) are short shank mouthpieces. Diameter of bell, 4 5/8". Length of valve casing: 6 1/16". Length of cornet, 17 inches. Weight: 2 lbs. 8 oz. The "New Wonder" Cornet is made in low pitch or high and low pitch, according to order. Victor cornets are setting the standard for the cornet world. Easy speaking, marvelously flexible, perfect in intonation and possessing unsurpassed beauty of tone. It is not strange they are being played by more world artists than any other cornet in the world. Now available in two bores - the 4A Small bore and the 80A Large bore. One of these two is the cornet you've been whishing you could sometime possess; it all depends upon what your engagement demands of you, which one you choose. 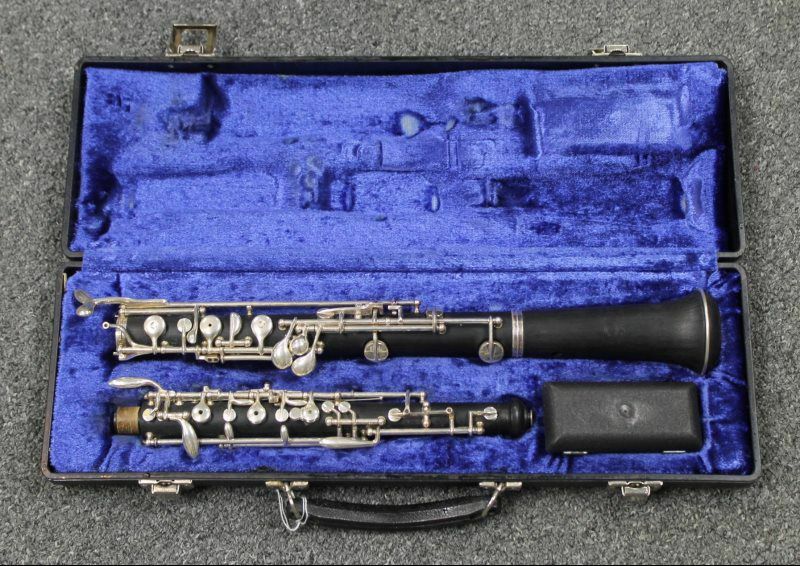 This well taken care of oboe just came in on consignment. It has been gone through by our expert repair shop. It plays like new! This is a great value on a USA made oboe. These do not come up for sale very often. - Get it before its gone!